Other Pieces of Me: An answer to the great debate? Well, I think we have finally made our diapering decision. The good news is that these decisions don't have to be permanent...once the Kernel gets here, my guess is our lives will be thrown into chaos and anything that isn't working for us is going to go by the wayside pretty quickly. But in the meantime, I have decided that I am not going to be cloth diapering our child (unlike my rock-star sister-in-law who has yet to allow the inconvenience of cloth diapers and the amount of washing to sway her eco-consious decision) and I will not be using disposable diapers either. 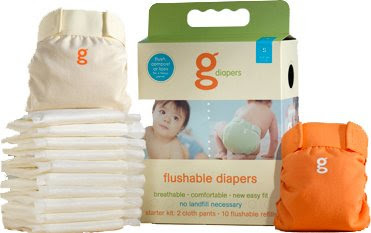 Instead, I am planning on using gDiapers. 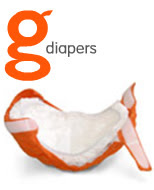 They are a cross between a disposable diaper and a cloth diaper in that they have a non-disposable cloth shell (or g-pant) that you use with a disposable insert. What makes the disposable insert so much better than a regular disposable diaper is that they are non-plastic, bio-degradable and flushable. Now, I am not so sure the plumbing in our 100 year old house is going to agree that the inserts are flushable, but if that doesn't work out, the inserts (the wet ones) are garden compostable too!! Cost wise, they are a pretty significant expense up front. However, I have heard that you can find some great deals on the g-pants on Craigslist and/or eBay and apparently the inserts are available from Amazon.com with a 15% discount if you sign up for auto delivery. I think if we are cautious about it, we can keep our costs similar to what disposable diapering would be. So to break it down: 1) there is no plastic 2) I reuse the outer shell 3) the inserts either flush down the toilet and go where other flushable waste goes; or I can compost the wet ones; or if I do send them to the trash, they will eventually break down much faster than regular disposable diapers and lastly, 4) with some work, we can hopefully do this in a cost effective way. 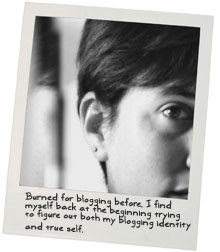 I am really hoping that this will be a good experience for us and I plan to blog about it so that other people can perhaps stop by and use our experiences as a resource. Again, who knows what will happen once the lil' guy gets here...but for now, it is nice to have made a decision on this. Hey! Thanks for the comment! Let me know if I can be of any help to you as you embark on your journey into using g's! We love them and use them exclusively!